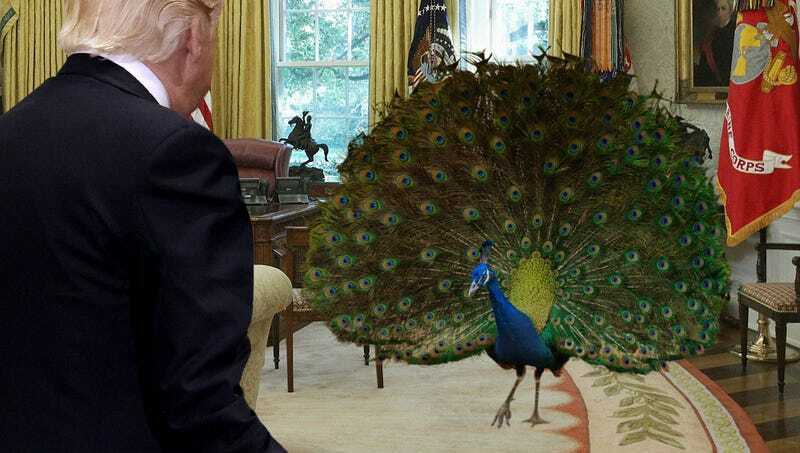 Well, here is just further proof that, almost 18 months into his presidency, Donald Trump’s White House is still in total chaos: A peacock just walked through the Oval Office and Donald Trump just stared at it until it left and didn’t say anything or tell anyone. This is seriously unacceptable. Mr. Trump, it’s time you get your White House in order. The whole disaster started this morning when a brightly colored peacock walked through the door of the Oval Office as President Trump sat signing papers and started pecking around the floor. In an incredible display of mismanagement, Trump did not shoo the peacock away or alert anybody on his staff to its presence, but instead sat straight up in his chair and stared right at the large bird as he quietly watched it strut around his desk. At this point in Trump’s presidency, you would hope that he would have at least been prepared to respond in some way when, after spending several minutes preening itself on the Oval Office sofa while Trump watched silently, the peacock fanned out its tail and knocked a portrait of Andrew Jackson off the Oval Office wall. Yet Trump remained completely motionless and simply looked on passively as the peacock turned and stared at him for about 15 seconds, then turned and walked past him back out into the White House hallway. Trump hasn’t mentioned the peacock to a single member of his staff. It seems like the peacock that walked through the Oval Office is going to be a secret that Trump takes with him to the grave, and that’s simply inexcusable. The American people deserve better than an administration so disjointed that moments after seeing an ornate bird walk through his office, the president would do nothing more than write “peacock” in the margins of his notepad and then continue on with his work as if nothing had happened. The Trump Administration has some serious explaining to do. If a peacock can walk through the Oval Office without any consequences, then the White House is in a state of unprecedented disarray, and we can expect some serious repercussions in the not-so-distant future.